How Will We Remember Gennady Golovkin’s Career? Fresh off his first official defeat of his professional career, questions surround the former middleweight champion Gennady “Triple G” Golovkin 38-1-1 (34 KO’s). Questions regarding his next move, which direction his career carries into the future, questions pertaining to the very fabric and foundation for his career. This past fight for instance, why he was pushed back by the smaller man? 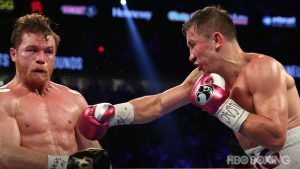 Succumbing to defeat via the hands of Saul “Canelo” Alvarez 50-1-2 (34 KO’s) sets an astonishing precedent, but not for the fact Golovkin suffered defeat to an elite fighter. It’s the fashion of how defeat manifested. The fact the smaller man originally beginning his career at junior welterweight (140lbs. ), walked down and stalked the career long middleweight is a bold statement. Future Hall of Fame fighter and ESPN boxing analyst Andre Ward expands on this notion. Leading up to the rematch, Golovkin and head trainer Abel Sanchez asked, begged, pleaded for Alvarez to stand and fight, to not utilize lateral movement in the rematch, to give the fans an action-packed show, thus providing Golovkin with greater opportunity to sink his powerful punches in hopes of bashing the Mexican star. Team Golovkin trashed Alvarez leading up to the rematch. Some of their ire (rightfully so) drew from the failed drug tests from the banned substance clenbuterol and the other part of their frustration stemmed from the results and how the first fight transpired. However, Golovkin and Sanchez got what they asked for, Canelo took the fight to Triple G, walking him down, pushing the bigger fight back, controlling the story of the fight, as Ward eloquently stated to Stephen A. Smith during their brief debate regarding the results of the rematch between Golovkin and Alvarez. The wounds are still fresh, it’s natural for one to be a prisoner of the moment and to make declarations and assessments to what was just witnessed. Ultimately as time passes, data continues to collect, the tea leaves assemble and we’ll be able to make a full assessment of the career of Gennady Golovkin. His name will forever be linked with Alvarez and as it stands now, he is on the wrong side of history. The tweet from podcaster and editor @LukieBoxing is a fair statement about Golovkin’s career. Digesting that statement, where is Golovkin’s signature victory against the A-side opponent? Which win was his signature win if he has one? Who is it against? Was his signature win against Daniel Jacobs, another close, disputed fight? Or is it against David Lemieux? Or perhaps his signature win was against the undefeated Kell Brook, the natural welterweight moving up two weight classes. Addressing the issue of unification of the world titles, Golovkin spent his entire professional career at middleweight and entering the rematch with Alvarez was a world champion since 2010. You would think somewhere throughout that long reign, unification of the division would have transpired right? Sanctioning bodies play a role, same with promoters, promotional companies and networks. These components play part and such is the dynamic of boxing from the business perspective. Even still, if going off the words and merits of Golovkin’s trainer Abel Sanchez or promoter Tom Loefller, the past four years or so Golovkin has been the A-side – meaning headliner of boxing, thus other fighters should want to fight him due to his stature in boxing and earning potential. But both Sanchez and Loefller were also quoted stating no one wants to fight Golovkin because they are afraid to get knocked out. The statements contradict each other and its perplexing trying to determine the purpose and angle for how they addressed Golovkin’s lack of great opposition and failure to unify the division. Even Golovkin doesn’t think fighters are necessarily afraid to fight him. As far as the fear factor his handlers attempted to plant into the minds of the public, sometimes it went as far as exposing gym wars and sparring stories – even at the expense of others. Golovkin’s sparring with Sergey Kovalev is part of the legend. For years Triple G was perceived by media and fans alike as some mythological boogeyman due to false narrative initiating with Triple G’s trainer and promoter, to be echoed by networks like HBO, ESPN and repeated by other writers and reporters throughout the media. But for some reason, Golovkin never unified the division. The last great middleweight Golovkin is compared to actually unified the division during his reign at middleweight. That person is Bernard Hopkins. Jermain Taylor acquired all the world titles at middleweight by virtue of defeating Hopkins. By comparison, current WBO welterweight champion Terence Crawford acquired all junior welterweight titles, unifying the division in two years’ time, while the current undisputed, unified cruiserweight champion Oleksandr Usyk, captured every world title in his division under less than five years’ time. Boxing history shows, if a truly great champion cannot unify the division and this can be virtue by a variety of circumstances, that great champion moves up in weight class, seeking greater and often times more luxurious challenges. Manny Pacquiao is a prime example. Sugar Ray Leonard, Roberto Duran, Floyd Mayweather, Miguel Cotto, Sergio Martinez, Vasyl Lomachenko, etc. The indication is if Golovkin experienced difficulty securing bouts against other elite fighters in his weight class, or experienced securing bouts against the champions holding the other titles, the logical move is forcing that belt holder to vacate or to move up in weight and seek other challenges. But that wasn’t the path for Golovkin. There is nothing wrong with his path, he has every right to handle his career, finances, whatever he wants how he sees fit. But when comparing him to other great all-time fighters or even his contemporaries and great fighters for this era, he falls short. And now, the same people suggesting Golovkin is an all-time great, legendary, unstoppable fighter are the same ones dismissing his greatness in light of his recent defeat. Remember, HBO analyst Jim Lampley openly stated Golovkin’s career is a failure if he fails to defeat Alvarez. Lampley was the conductor on the Triple G train. “He’s trying to make a statement [Saturday] night to say that he’s the greatest middleweight of all time,” Lampley said about Golovkin leading up to the rematch. For history to reserve a fonder memory of Golovkin he needs drastic wins against higher level opponents but at 36-years-old, sand falls faster in the hourglass and with it opportunities shrink. There was a lapse of talent in the middleweight division for most of the decade, only recently experiencing a resurgence of talent with the emergence of Daniel Jacobs, Billie Joe Saunders, Jermall Charlo, Saul Alvarez, Sergiy Derevyanchenko and Demetrius Andrade. Can Golovkin beat Alvarez in a third fight? It’s possible, it’s not like he wasn’t competitive – it was a close fight. Same applies for Golovkin’s chances against Jacobs as he defeated in the past. How does Golovkin fare against the other fighters mentioned? Will Golovkin challenge the other middleweights or will he emulate Hopkins, ascending to the higher weight divisions, facing new challenges as the previous middleweight king before him did? Or is he on his way towards retirement, seeking another large payday or two, aiming for further financial security? If the latter option is the answer, securing one or two more fights with Canelo is should be the objective for Triple G. Whether it comes to fruition is another story. For Golovkin, the context of the comparisons will dictate how he’s remembered. World class trainer and boxing analyst Teddy Atlas implies, was Golovkin overrated; a talented fighter with good skills but with glaring weaknesses never exposed in the ring because of favorable match-ups against weaker opposition and media hype. Which begs the question, how will we remember Gennady Golovkin?